I may receive a commission if you purchase through links in this post. I am not a doctor; please consult your practitioner before changing your supplement or healthcare regimen. 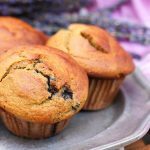 Paleo Blueberry-Banana Muffins combine the moistness of bananas with the plump juiciness of blueberries — either fresh or frozen. 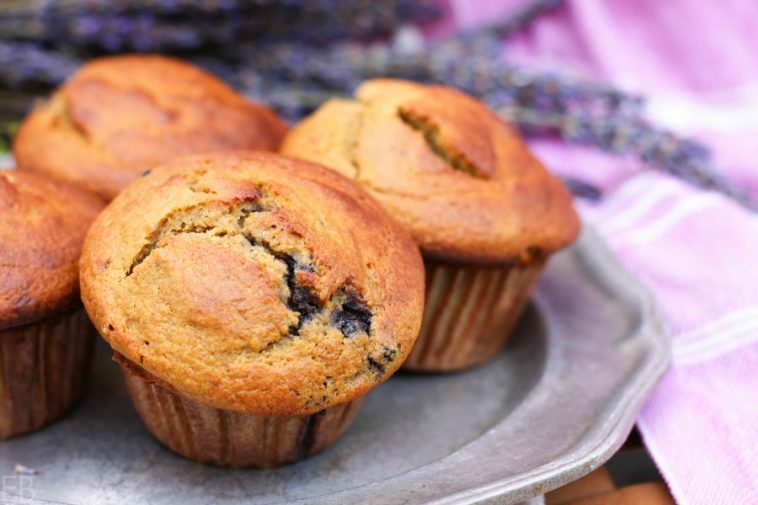 The texture of this muffin recipe is just perfect, thanks to Otto’s Cassava Flour, rich in prebiotics. I never over-sweeten my muffins, because I want them to be truly healthy. So these jewels aren’t too sweet to be a part of any meal: breakfast, lunch, snack, or alongside soup or salad for dinner! 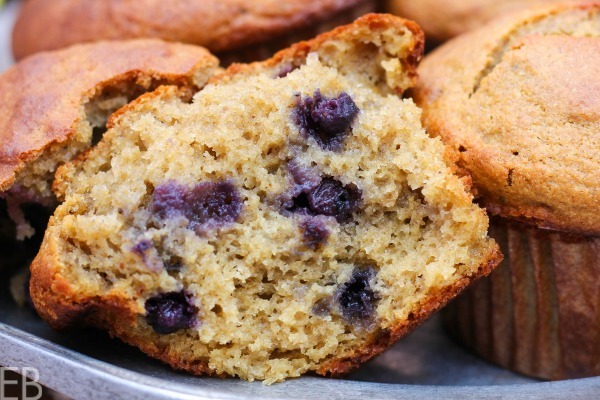 Paleo Blueberry-Banana Muffins are also nut and dairy-free. Making these muffins, I was reminded of the retirement homes where elderly folks live symbiotically with younger people, so both groups derive a benefit. Instead of the more popular convalescent homes where the aging often pass their days neglected, lonely and/or depressed, the elderly residents in nursing homes-meet-dorms enjoy the companionship of another group that also needs assistance (often financial). Here’s one in the Netherlands, and here’s one in Ohio. Each group experiences greater fulfillment and happiness! My boys like to eat their bananas GREEN, when they’re full of prebiotic goodness, and they’re sticky, starchy. The moment brown spots start appearing I better have a plan, because I’m way too frugal to compost brown bananas. 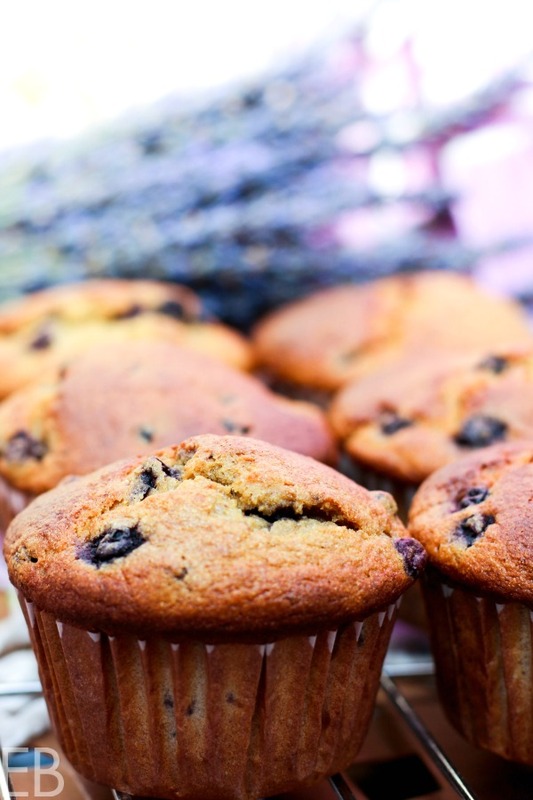 We freeze them for smoothies, dehydrate them, or now — we make these fabulous muffins! So the perfect companionship is created: a whole new home for both fruits! My mind functions best in a world of metaphors and associations, apparently. 😉 So there you have it: The black banana takes off its old, unappealing housing and exchanges it for the beauty of a freshly baked, golden, blueberry muffin. A better home. The special flour in these muffins is cassava! I love cassava SO much because it not only creates a tender (like white flour) crumb, cassava is also a complex carb and rich in a kind of prebiotic (food for probiotics) called resistant starch (in this case RS3). Resistant starch is a starch found in certain produce items (in this case the cassava root) that resists digestion, instead benefiting the microbiome of the colon. (Find cassava flour with free shipping here.) Long story short, cassava flour is a Paleo flour that is ideal for digestive health and is also delicious! You can find many recipes on my blog that contain Otto’s Cassava Flour and other forms of resistant starch. Some reader favorites include: Moist Zucchini Cake, Cinnamon Cupcakes, Sourdough Waffles and Smashed Potatoes. 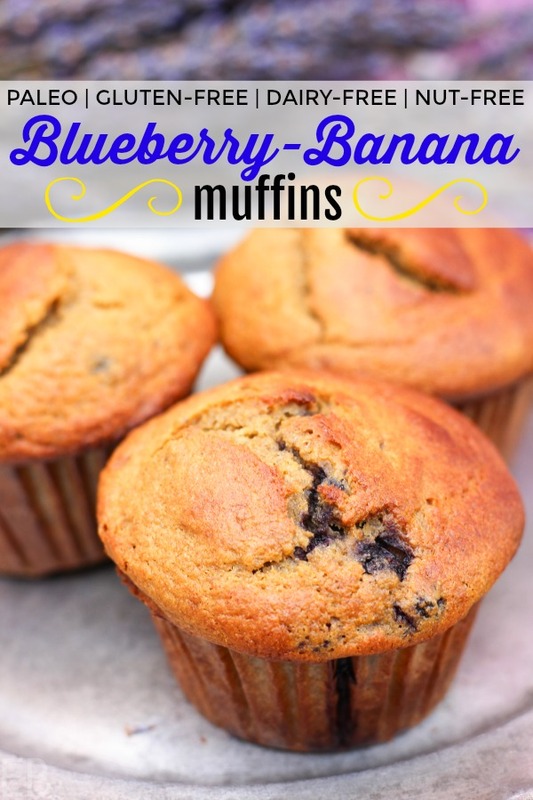 Blueberry-Banana Muffins are also higher in protein and lower is sweetener than most muffins. I believe that supporting healthy blood sugar levels and getting the right macronutrients is a key to happiness and wellness! Healthy blood sugar levels means eating lots of healthy fats and protein, and eating simple carbs not at all or in smaller quantities, after or with protein and fat. Getting the right macronutrients in our diet means eating plenty of protein, fat and complex carbs. While the simple carbs found in sugar, even unrefined sugars, yield immediate energy, they also cause a spike in insulin production. What our bodies need is the sustained energy that complex carbs, like those found in cassava flour, provide. 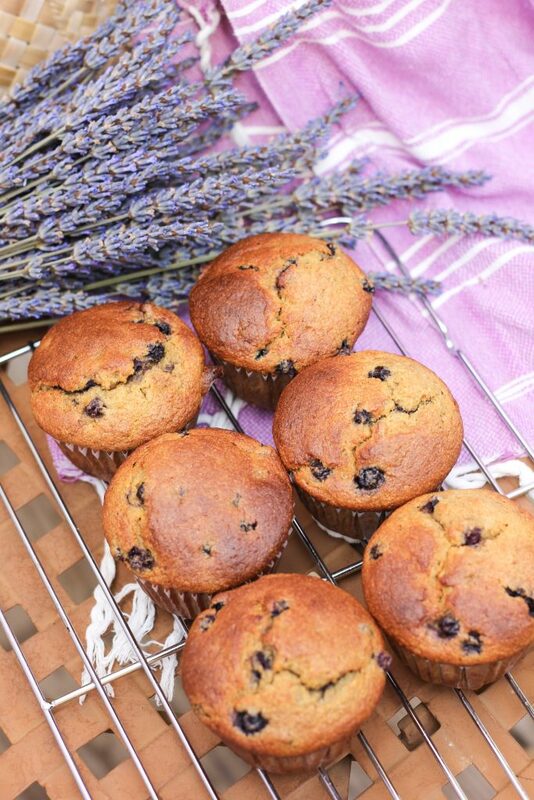 So, just a bit of sweetener in these muffins, plus lots of natural sweetener coming from the bananas and blueberries. But you can see from the photos, the texture of the tops and middles is just perfect! Speaking of textures, for a protein boost, I fortify these muffins with collagen (which is also great for the texture of the muffins!). I choose this collagen because they test for pesticide residue. Not only is the collagen grass-fed, the grass itself is being grown sustainably. Healthy grass-finished cows mean nutrient-dense collagen for us! The amino acids in collagen help our bodies to repair themselves, which includes gut healing. These muffins can be made any size: regular, jumbo or anywhere in between (or mini, of course). I like jumbo muffins the best, personally. But if you like having more muffins, for smaller portions, perhaps alongside a larger meal or for packing in lunches, you can make 12 muffins with this recipe. I made 10 when I photographed the muffins: I made 6 regular size and 4 slightly bigger. I give the baking times accordingly, below. Preheat oven to 350 degrees Fahrenheit. Line muffin tin (6-12, depending on how large you want your muffins) with liners. Set aside. Place wet ingredients and sugar (not including the blueberries) in blender and puree until smooth: bananas, eggs, fat, coconut sugar and apple cider vinegar. In small/medium bowl, combine dry ingredients: cassava flour, collagen, baking soda, cinnamon and sea salt. Pour dry ingredients into blender and pulse briefly to mostly combine. Add blueberries and stir in while also completing the combining of batter ingredients. Do not over-mix. Pour equal portions of batter into muffin cups. Bake in preheated oven until very golden brown on the top and toothpick inserted in center comes out clean or with dry crumbs adhering, 20-25 minutes, depending on muffin size. Find Otto's Cassava Flour HERE. Find the best grass-fed gelatin HERE. Find jumbo muffins pans HERE. This time of year, our home is brimming with blueberries and brown bananas! Do you need a better home for aging bananas too? Those muffins look so lovely. Banana blueberry is a wonderful flavor combo for them! Thanks, Raia! I’ve actually not made this flavor combo before, I don’t think, in all my years making muffins, lol. But this summer — so many brown bananas right when my boys come home with buckets of blueberries from picking. Pretty fun! 🙂 I love that the recipe uses 3 bananas! This sounds like the best combo of flavors ever- yum! I love the combination of this recipe. I always have too much supply of bananas and some become over ripe so I used them for this. I hope that’s fine? We don’t have fresh blueberries where I live so I bought a can. Overall, the result was okay. It’s moist and not too sweet. My kids tend to like sweet foods, but I am doing my best to train them to avoid too much sweets. They ended up dipping the muffins in honey. Haha, sounds like a lot of kids, wanting things sweeter and dipping in honey. Yes, I’ve worked hard over the years, and still do, on helping my kids to be aware and keeping their sweets limited. There’s nothing like not eating sweets at all to remove the sweet tooth, as well as a high fat and high protein diet. Using ripe bananas was great. Canned blueberries could work, if well drained. Thank you for your comments! I’ve just recently started playing with cassava flour – can’t wait to try this one out! Great, Nadia! You’ll be hooked! 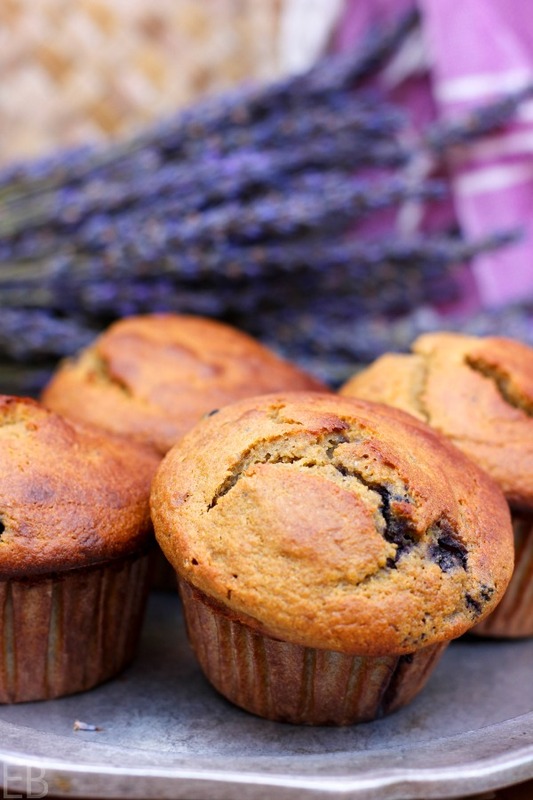 Cassava flour is such a boon, and I hope you love these muffins too! Haha, love it, Daniela! 😉 Thanks so much!! Enjoy! 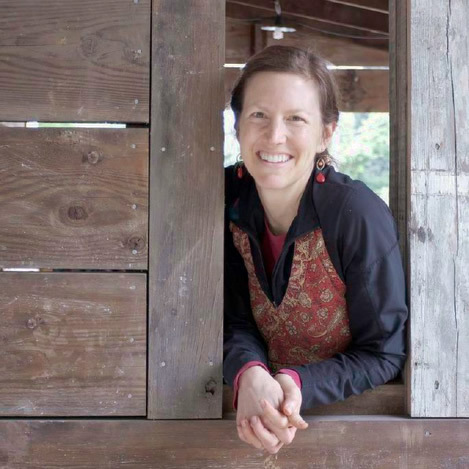 Cassava flour rules! I love it and was so happy to see my local Whole Foods carries it now! I would love to try these but am wondering if it would still work if I replaced the eggs with gelatin or chia eggs as I’m allergic. Any idea? Megan….my husband made these muffins and while they tasted really good, the blueberries sank to the bottom on all of them. My husband said the batter was very thin compared to most muffin recipes. Any ideas what happened? Should he add more cassava to get the batter to a thicker consistency? Hi June, did your husband use fresh or frozen blueberries, and were they large or small? Megan – he used frozen, which I believe is the reason they sank to the bottom. Plus he did not coat them with flour, like he always does with blueberries, which helps to keep them suspended in the batter. We’re gonna give them another try. Okay, June, great. I’m sorry, because I’ve been using really little blueberries this season, which may account for the difference too. It’s funny because I usually make really thick batters, but this one is thinner. So I guess the other trick, if needed, is to use smaller berries, which may not work for you if you already have bigger ones. But let’s see what happens when you roll the berries in cassava flour first. I like that method too, even though I didn’t use it with this recipe.